Explore the philosophical depths of Batman, Superman, Captain America, and your other favorite superheroes — FOR FREE! Why doesn’t Batman just kill the Joker and end everyone’s misery? Does Peter Parker have a good life? What can Iron Man teach us about the role of technology in society? Bringing together key chapters from books in the Blackwell Philosophy and Pop Culture series, this free superhero sampler engages the intellectual might of big thinkers like Aristotle and Kant to answer these questions and many others, giving you new insights on everything from whether Superman is truly an American icon to whether Wolverine is the same person when he loses his memory. Whether you’re looking for answers or looking for fun, this classic compilation will save the day by helping you gain a deeper appreciation of your favorite comics with an introduction to basic philosophical principles. 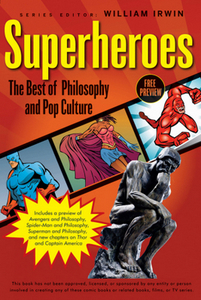 Includes chapters from: Avengers and Philosophy, Spider-Man and Philosophy, Superman and Philosophy, and more! Gives you a perfect introduction to the Blackwell Philosophy and Pop Culture series FOR FREE!